The MOU was signed by Tan Yok Gin, PUB Deputy Chief Executive (Operations) and Grundfos’s Poul Due Jensen. Singapore’s Environment and Water Resources Minister Dr Vivian Balakrishnan, and the Danish Environment Minister Kirsten Brosbøl attended the signing ceremony. Signed at the Singapore International Water Week (SIWW), the MOU will create a platform for discussion and exchange of ideas in areas such as water and energy efficiency, water and wastewater treatment, as well as water quality monitoring. The collaboration will focus on water innovation, including the development and application of high efficient pump solutions in water treatment, R&D in wastewater treatment solutions and disinfection technologies, and applications of in-pipe energy recovery technologies. “The research collaboration with Grundfos will allow us to tap on Grundfos’s strength in the development of pump solutions for water treatment, and at the same time explore collaborations in new areas where Grundfos is venturing to, such as used water treatment to further boost the growing vibrancy of the R&D landscape in Singapore,” said PUB chief technology officer Harry Seah. 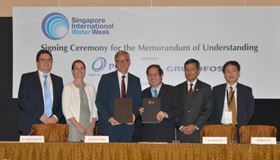 “Through this strategic agreement, Grundfos will support Singapore’s endeavours in addressing challenging water issues. These span from the management of scarce water resources to water efficiency management systems for heavy industrial users. Grundfos’ Water Innovation Centre in Singapore will enable multi-agency collaboration and information sharing on water and wastewater management and technology, so as to address the impact of climate change and growing economy on global water challenges,” said Poul Due Jensen, group senior vice president and regional managing director for Grundfos Asia Pacific.